Govardhana Puja is celebrated in the month of Kartika (October – November) to commemorate the pastime of Lord Sri Krishna lifting the Govardhana Hill to protect the residents of Vrindavana from the wrath of Indra. When the Supreme Lord Sri Krishna saw the residents of Vrindavana preparing for Indra-yajna, He suggested that they should forgo the worship of Indra and instead worship the Govardhana Hill. On coming to know of this, Indra became angry and sent a devastating rainfall over Vrindavana. Krishna picked up the Govardhana Hill with His little finger and it gave shelter to all the inhabitants of Vrindavana. Indra became conscious of his offense and begged for forgiveness from Krishna. Thus the Supreme Lord established that a devotee who is surrendered to the Supreme Lord and engaged in devotional service is free from all obligations and need not worship any demigods for material favor. This pastime is known as Govardhana Lila and is described in the tenth canto of Srimad Bhagavatam. As per the instructions of Krishna and following in the footsteps of the residents of Vrindavana, this festival is celebrated every year in the month of Kartika. Devotees prepare varieties of foodstuffs with grain and ghee (like rice, dhal, halva, pakora, puri, etc.) and all kinds of milk preparations (such as sweet rice, rabri, sweet balls, sandesh, rasagulla and laddu). The food is stacked like a small hill and offered to the Lord. Then it is distributed to everyone as prasadam. Hence, this festival is also called Annakuta Festival. Devotees also worship the cows on the day of Govardhana Puja. Krishna is known as Gopala – the protector of cows. There is also a prayer in Vishnu Purana (1.19.65) that states: namo brahmanya-devaya go-brahmana-hitaya ca. Here Krishna is described as the well-wisher of the cows and the brahmanas. The cows are decorated and fed well. Keeping the cows in front, devotees circumambulate the Govardhana Hill. The Deity of Lord Sri Krishna is decorated in Giridhari alankara, holding the Govardhana Hill on the little finger of His left hand. 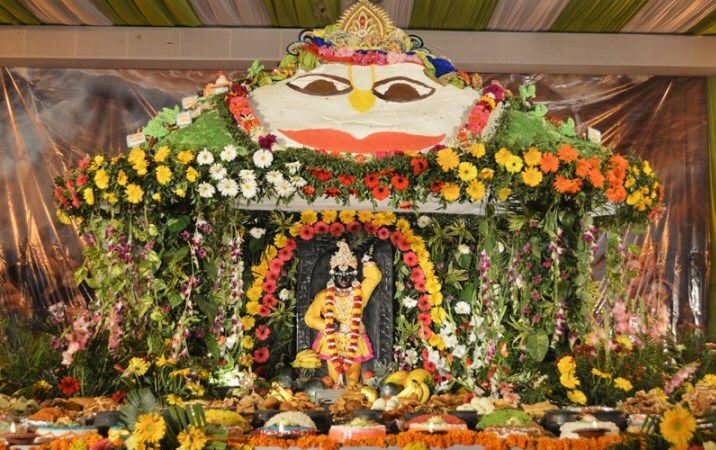 The devotees of ISKCON make a replica of the Govardhana Hill with egg-less cakes and a variety of cookies prepared in the temple’s own bakery. The Govardhana cake is offered to the Deities of Sri Sri Krishna Balarama and later distributed to all the devotees. The cows are well decorated and offered worship. An arati is performed for Gopala, the protector of the cows. Devotees sing various songs like Yashomati Nandana. The Govardhana pastime is narrated to everyone. A grand arati is performed for Krishna Balarama while the devotees sing Sri Govardhanashtakam – eight verses glorifying the Govardhana Hill.